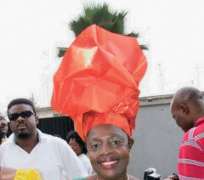 Madam Kofo is one lady who has made a name for herself in the entertainment industry. It didn't come as a surprise that the management of O'jez Entertainment centre has decided to host the lady later this month. The event which also coincides with the actress's birthday promises to be grand as guests will be treated to undiluted highlife sounds as performed by O'jez and Evergreen Bands. Tunes of highlife greats such as Victor Olaiya, Fatai Rolling Dollars, Alaba Pedro, E C Arinze and Bobby Benson will rent the air, Life and Beat gathered.